I’ve been working on a number of new projects that use the Flat i-Cord as part of the design; hats, scarves, and gloves to give you a few hints. The samples are done and will be offered to our test knitters in a few weeks. One of these patterns will be added at no additional cost to the Iquitos pattern shown above. 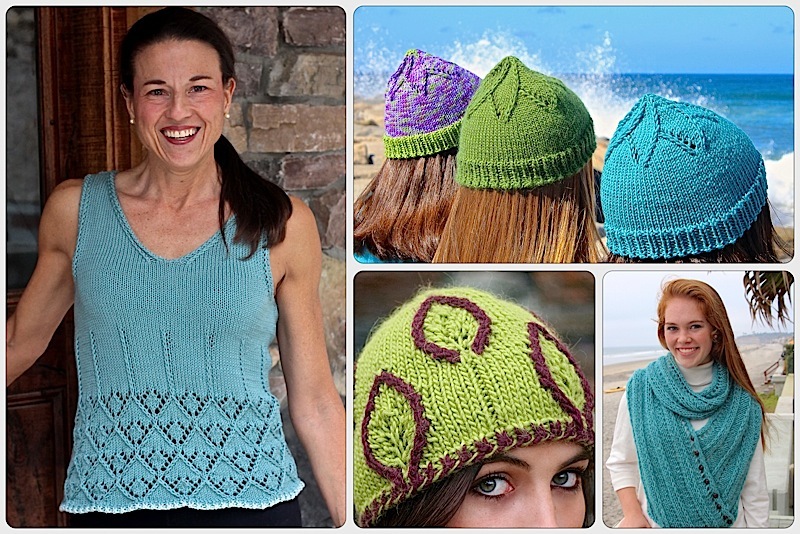 All the proceeds from the Ravelry pattern go to support our charity. First, I have to buckle down and finish up a few patterns that highlight a new use for the Showy Decrease. A note will go out to all of you that signed up as test knitters very soon. It’s the first time I’ve gotten ahead of myself in time to use this new program. 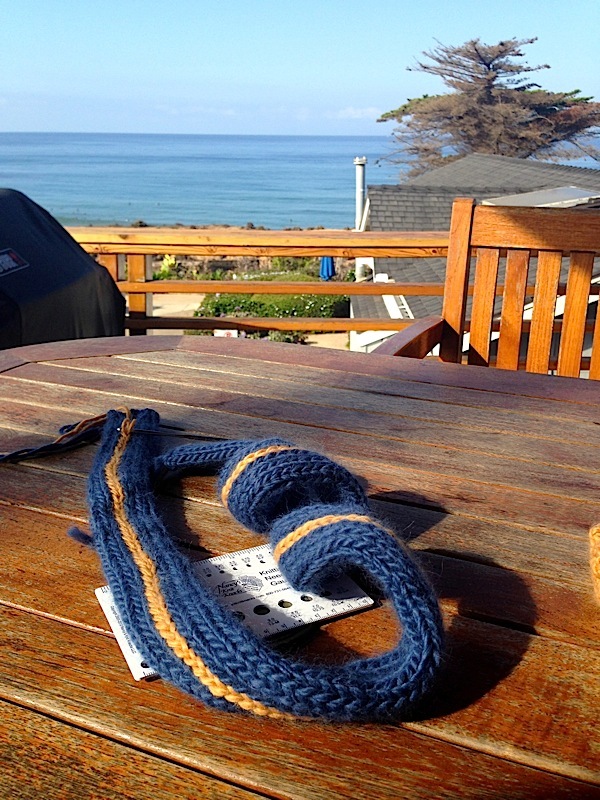 I had a simply delightful afternoon yesterday finishing up a striped Flat i-Cord as I visited a house in Del Mar. There’s just something about being right on the ocean. There was a lot of knitting, some surf watching, a peek at some playful dolphins and a light breeze. 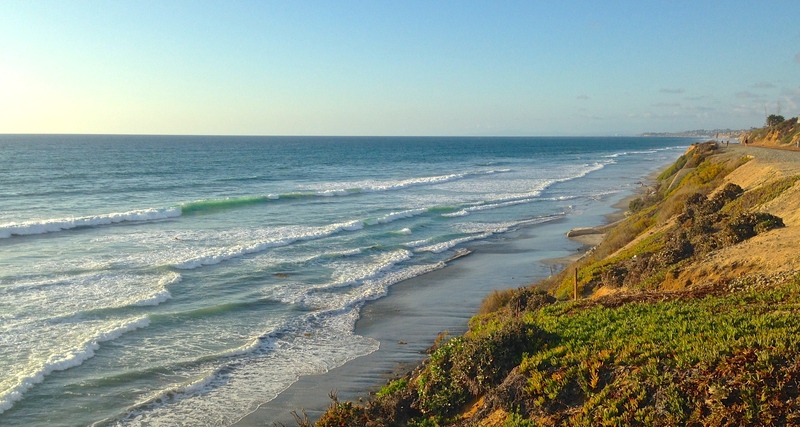 Fall is a wonderful time to visit San Diego, much nicer than spring and less crowded than summer. I promised myself when we moved here six years ago, I wouldn’t take the weather for granted and I never have (especially after the winters we left behind in Chicago and the Northeast). A Super Wide Flat i-Cord: I was experimenting with the original 6-stitch version of the i-cord. This one has 5 stitches on each side plus the 2 stripes for 12 stitches total. That’s twice as wide as the basic. I thought I’d need the stripe to close up the gap created by using this many stitches, but they spread out nicely without one. I think it’s due to the soft structure of the Cascade Highlands Duo, a mostly alpaca yarn. It was still easy to find the column for the stripe so I decided to use yellow yarn on just one side to coordinate with the main project (that peek of yellow in the corner). As you can see this Flat i-Cord is almost 2 inches wide. Nice! Is anyone else thinking ‘belt’? Here’s a Tip: When adding a contrasting color crochet chain, use your crochet hook to pull longer lengths of yarn part way down the i-cord. 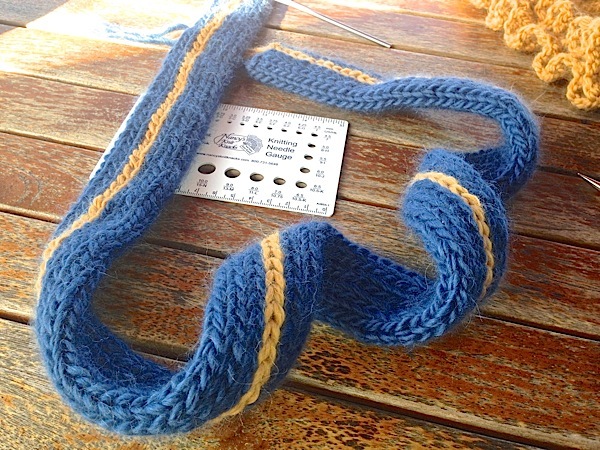 These yarn worms reduce tension on the hook as you work the chain. More details are available in the Iquitos Scarf pattern which is really more of a full tutorial on Flat i-Cords. Free Pattern Sample Pages: Did you know we have free sample pages of many of our patterns available on our web site? You can find the Iquitos Scarf scarf here. 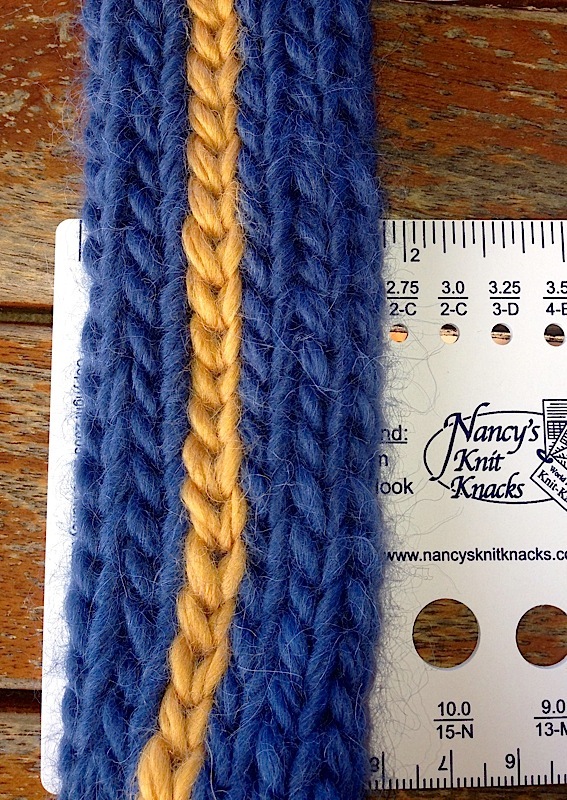 You can also find a free tutorial download for the basic Flat i-Cord on our web site. 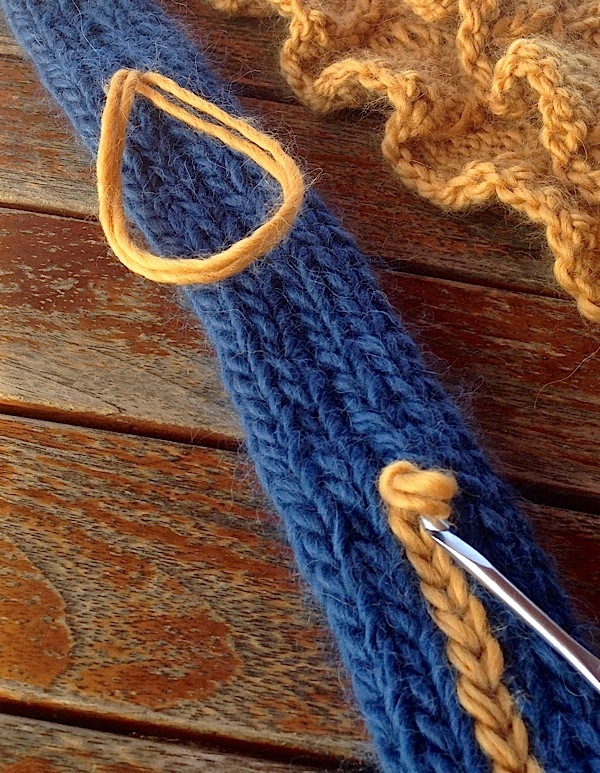 It will get you started on knitting your first Flat i-Cord. You’ll find tutorials for some of our other favorite Nuances like the Showy Decrease and 2-Tier Hat top there too. Stop by, take a look, download some free files and let me know what you think. This entry was posted on October 20, 2014 by Laura Cunitz in Flat i-Cord, Nuances and tagged Flat i-Cord, Free Knitting Tutorials.